Sometimes, dog owners can tell when something isn’t right with their dog’s digestive system. They may notice sudden stomach upsets, with vomiting, gas, straining when going to the bathroom or loud noises coming from the animal’s intestines. These problems can often become more frequent when dogs get older. Some types of commercial dog food do not have a sufficient amount of fiber added to the food. Also, the fiber may broken down by commercial processing so much that it is no longer well utilized by the intestines. If you suspect a slowdown in your dog’s digestive system, consider adding a bit of fiber to their diet to aid healthy intestinal function. As with humans, fiber can aid better gastrointestinal function, and it can also help with weight management. In addition, if your dog tends to be constipated, adding a little fiber can make waste pass more easily through the intestines. If your dog has been diagnosed with diabetes, increasing fiber in his or her diet can also help remove excess glucose from the body and stabilize blood sugar levels. However, you should always check with your veterinarian before increasing the fiber in your dog’s diet, because it can also cause increased gas and can make some gastrointestinal conditions worse. Most commercial dog foods contain a significant amount of fiber. However, in some cases, the fiber used may be the ingredients that cause food sensitivities in your dog. Always read labels carefully and note the content percentages to understand what you are feeding your dog. Not every food is well tolerated by every animal. 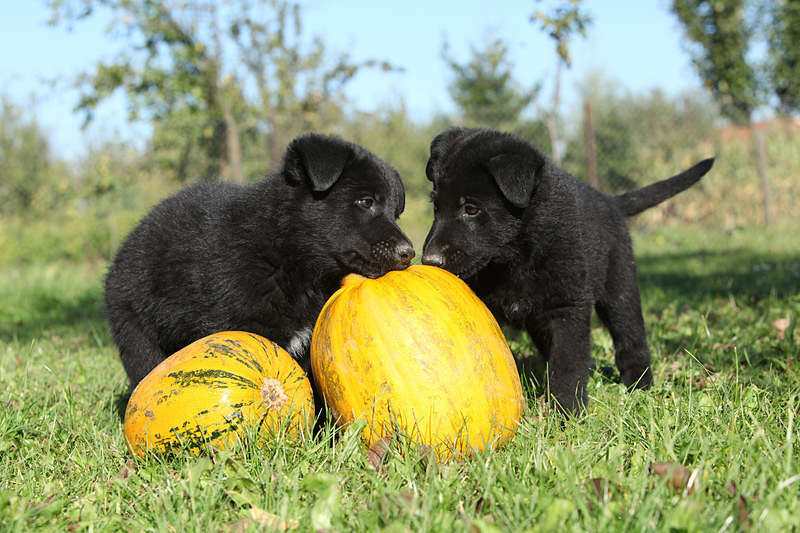 Canned pumpkin is a standby recommendation by veterinarians for canine constipation and other digestive issues. Canned pumpkin is loaded with fiber in a tasty, natural form. Don’t confuse canned pumpkin with “pumpkin pie filling,” which contains sugar, spices and other ingredients. A tablespoon on top of your dog’s daily meal is enough to improve gastrointestinal function. Apples are another easy, convenient source of fiber for dogs. When eating an apple, cut off a small piece for your dog to eat, as well. Apples also contain many vitamins and antioxidants that are beneficial for health, both in humans and in canines. The same bran you have for breakfast can help keep your dog’s digestive tract in top condition. Just a small amount makes a tasty and healthy addition to his daily diet. Moisten the bran a little with water before feeding to make it easier for your dog to digest. Brown rice is another high fiber food that you can add to your dog’s dish. The brown variety of rice still has the outside husk, unlike the processed white rice. This husk is what provides additional fiber, as well as many more nutrients than white rice. As with all changes to your dog’s diet, you should add foods gradually, monitoring the animal closely for any upsets or disturbances. For some dogs, a bit of fiber can help to improve their gastrointestinal health and energy levels. However, not every dog is alike, and additional fiber can have unexpected results. If you take care with these additions, you will be able to avoid unnecessary upsets and improve your dog’s general health.